It turns out our lucky VH Sauces prize pack winner, won on another blog as well. 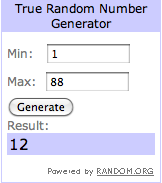 Since the rules clearly state you can only win once, we're drawing another winner! We don't introduce much culture into our meals, but love reading the ideas. We do however, try different sauces and dips with different foods! Hello, stopping by to say Congrats on the blog awards. You can check them out here.